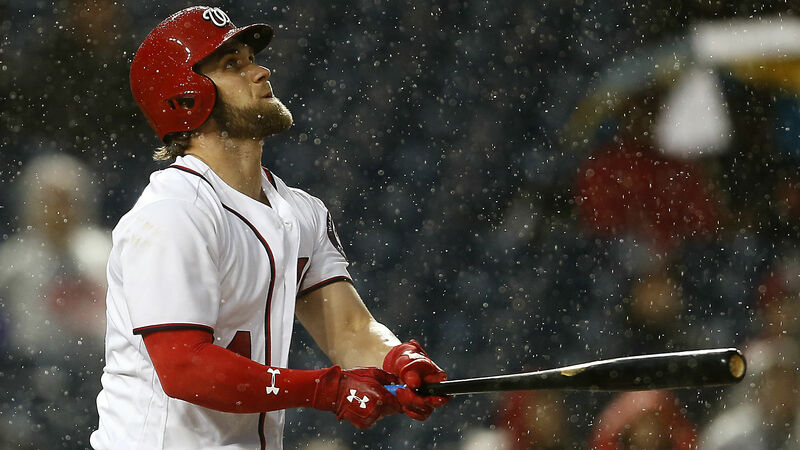 Nationals outfielder and perennial Most Valuable Hair candidate Bryce Harper will be headlining this year’s Home Run Derby as Washington, D.C., will play host to the 2018 edition of the competition and the MLB All-Star Game. The 2015 National League MVP sat out of the 2017 derby in Miami in preparation for the upcoming contest in his home park. Harper hit 29 home runs last season and is on pace to hit (some number) this season. When is the 2018 Home Run Derby? The 2018 Home Run Derby will take place Monday, July 16 at Nationals Park in Washington. How can I watch the MLB Home Run Derby live? ESPN will broadcast the 2018 Home Run Derby live beginning at 8 p.m. ET. How can I stream the Home Run Derby online? You can live-stream the Home Run Derby on the WatchESPN app. Jesus Aguilar, 1B, Brewers; Javier Baez, 2B/SS, Cubs; Alex Bregman, 3B, Astros; Freddie Freeman, 1B, Braves; Bryce Harper, OF, Nationals; Rhys Hoskins, OF, Phillies; Max Muncy, 1B, Dodgers; Kyle Schwarber, OF, Cubs.